The harmful algal bloom that has been affecting Florida's West Coast for more than a year has followed ocean currents around the southern tip of the state and began affecting beaches on the East Coast in late September. 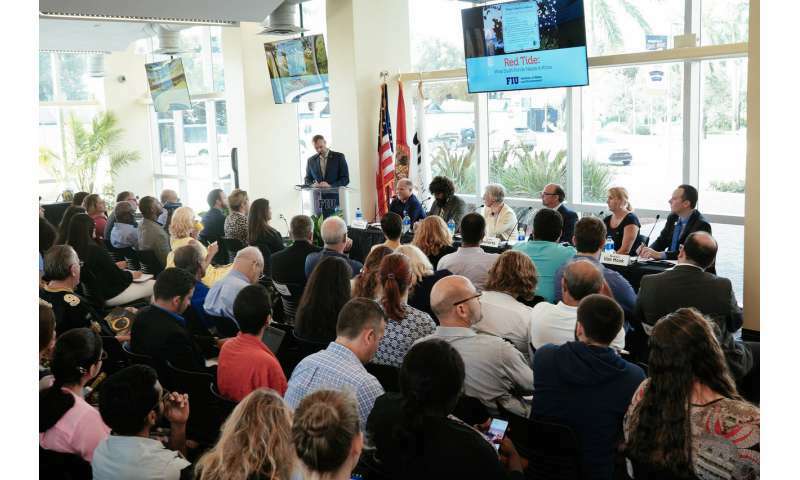 FIU convened a panel of experts to help the community learn about what causes Florida Red Tide and how it affects the environment, health, business and tourism. The panel was moderated by College of Arts, Sciences & Education Dean Mike Heithaus. College of Arts, Sciences & Education researchers Thomas Frankovich, Jose M. Eirin-Lopez and Kathleen Rein are studying the organism that causes the harmful algal bloom. Frankovich recently found a different type of Red Tide in a canal in the Florida Keys. Eirin-Lopez is studying how toxins from Red Tide might affect the DNA of marine life. Rein is working to develop a more effective treatment for manatees affected by Red Tide. The experts said people may be able to help curb the spread of Red Tide. "When it comes to the critical ingredient here – that is the nutrients going into the water – that is something we can act upon," Eirin-Lopez said. "That is the real, important element fostering the bloom, [making it] more frequent and longer in extent." For Tomás Guilarte, dean of the Robert Stempel College of Public Health & Social Work, the big concern lies in the unknowns. "What keeps me up at night are the long-term consequences," he said. "We don't know the effects of chronic low-level exposure. We may be consuming fish or shellfish that accumulate these toxins over time." Panelists noted the state tests shellfish, but there is no similar testing program for fish. They recommended against eating seafood caught in areas affected by Red Tide. Carolin Lusby, an assistant professor in the Chaplin School of Hospitality & Tourism Management, suggested officials create a simple, color-coded system to help tourists differentiate beaches affected by Red Tide. Distributing information that is timely, accurate and credible is critical for health, tourism and business, Guilarte said. "We should be putting out which beach is a red beach or not," Lusby said. "Simple as that – red beach or green beach." Brian Van Hook, associate director of the Florida SBDC at FIU's College of Business, said it can take years for businesses to overcome challenges caused by natural disasters. He urged business owners affected by Red Tide to report it to Florida authorities at floridadisaster.biz. This information helps officials see which counties are impacted and need resources the most. Marina Paula, a junior majoring in recreation and sports management, attended the request of the professor who teaches her Health without Borders course. The class promotes health as a state of complete physical, mental and social wellbeing. "I, honestly, didn't know much about red tide," Paula said. "Listening to the experts makes me want to do more research on it and share that information with my family and friends. It's important the community know more about it." FIU researchers continue to monitor Red Tide. They recently deployed a buoy near the Biscayne Bay Campus and could serve as an early alert if conditions deteriorate. More information: — Ayleen Barbel Fattal and Evelyn Gonzalez contributed to this story.